This movie took me on an ever changing range of emotions. At first, I felt that the casualness with which the pregnancy begins and the flippant way that Juno handled it was just another example of the continuing Hollywood mission to desensitize today’s youth to the stigma of teenage pregnancy. The detachment of the father, the matter-of-fact decision, first to have an abortion, and then later to give up the child for adoption, just left me cold and wondering if any of these folks actually experience real emotions? Allison Janney, as the step-mom, and Jennifer Garner, as the potential adoptive mom, seemed to be the only characters who actually behaved in a way that seemed consistent with the circumstances. While the ending was bitter-sweet in many respects, it did at least stir up some emotional response, which for me was missing during the rest of the film. An OK film that could have been a lot better. I liked this one for the most part when I saw it...but I haven't wanted to see it again..or get the DVD. My wife watched this one night when we had an HBO free weekend. She told me that she didn't care for it. So I've been leery about seeing it. I thought this one was just okay - not very memorable. A friend of mine gave this to me and I haven't wanted to watch it again. I think I quite liked it, actually. Teen pregnancy happens. The writer simply deciced to depict a family that comes totermswith the facts quick and rather than going for abortion they go "pro life". Agreeably, maybe everything goes a tad too easy for Juno, somethign you might not necessarily want to portray in a PG-13 film about teen pregnancy. So, should the rating have been higher? Or should Juno have suffered more as to make teenager more aware of the potential problems...? I just felt that an issue as important as teen pregnancy was handled a bit too flippantly. Perhaps it's just me. Or should Juno have suffered more as to make teenager more aware of the potential problems...? God, no. I doubt melodramatic after school specials have the effect their creators might intend. 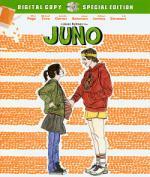 I really enjoyed Juno. It is poignant and snarky, a balance most comedies fail to achieve. Some may find the dialogue a bit overstylized and misread that as a lack of emotions, but I don't think that is the case. No - I have to agree. Maybe this is due to the fact that I don't want to see my daughter in the same situation. But anyway, I like this movie somehow. I liked Juno, I think certain parts are fairly realistic to be honest, I know teenagers that reacted that way to being pregnant.... I went to school with girls who now have 2 or 3 kids... atleast 10 girls left my school at 16 to have babys. There are two things I like about this film firstly that Juno is not a "chavy" poor scummy kid who lives in the "ghetto" thats what most teenage pregnancies are in films and the second thing I liked was that they didn't play her step mum off as an evil step mum. Achim and Matthias have both said reasons that I like it for to. Absolutely agree with them. Additionally, the slightly unreal dialogue helps support what Emma says; while being over-stylised in itself, it perversely becomes more honest and realistic overall so the characters don't become caracatures or predictable. Excellent writing. I might have to watch this again. I really don't remember caring for it the first time - I must have missed something. Or, the positive reviews are wrong! i just rewatched it and still enjoyed it the second time around. none of the characters come across as overly unrealistic - at least i have the feeling that i could take any of the characters position and see it from their point of view. and again i really enjoyed jk simmons' character, he takes the cards that are handled to him and deals with them without freaking out.